In mathematics and the arts, two quantities are in the golden ratio if the ratio of the sum of the quantities to the larger quantity is equal to the ratio of the larger quantity to the smaller one. 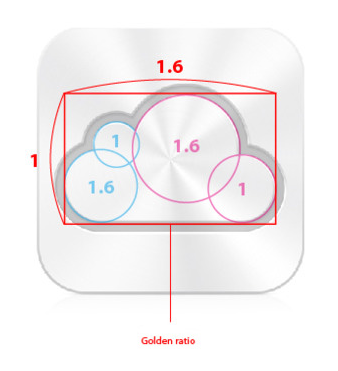 The golden ratio is an irrational mathematical constant, approximately 1.6180339887. Let’s say you want to draw the perfect rectangle. Using the golden ratio, what you’d do is draw a perfect square, then draw a line through that square. Now in the top half of the square, draw a diagonal line from the lower left corner to the upper right corner. If you then moved that diagonal line like an hour hand from the upper right corner to trace an arc above the square, the highest point of that arc is the rectangle’s ideal height according to the square’s golden ratio. Well its not only Apple who taking the advantage of this gold method, we have already seen it from the Twitter’s 2.0 redesign.